"Would you look at that?" my husband whispered as we stood under the electronic sign listing regional train departures from London's Waterloo station last Sunday evening. He inclined his head slightly toward a stocky young woman wearing thigh-high black studded boots. She had chosen a white skirt printed with wide, black, horizontal stripes, which would have made even Audrey Hepburn look portly. It started an appalling four inches above the boots, exposing too much white skin to the rest of us. I always wonder what kind of friends people like that must have. I mean, why WOULDN'T they tell her? I almost missed seeing her because I was already absorbed in watching an ancient British darling shuffling daintily along the vast hall wearing a forest green felt cloche hat complete with soaring pheasant feathers atop her silver hair, a fashion statement that hasn't been seen in the United States in 50 or more years. After living on the road in rented houses and apartments for two and a half years, my husband and I have used almost every method of transportation possible and we're ruminated often about the differences one sees on pubic conveyances in various parts of the world. The Brits line up, the Germans are quick to let older or infirm people have a seat, and our beloved French would rather you NOT be there at all. The one constant is that when you're on a bus, ferry, subway or streetcar, you are definitely in close proximity to the other people riding along. That closeness brings an opportunity to inspect human life as it really is -- clothes, mood, haircuts, attitude, family dynamics and, of course, personal hygiene become extremely real when a person is three inches away! 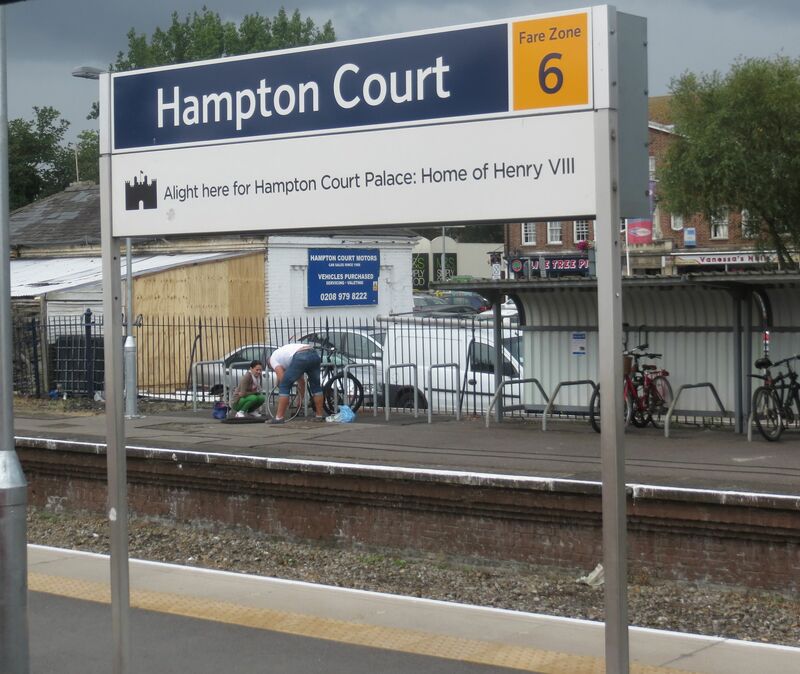 We snagged some seats while we waited for our train to East Molesey, a Thames-side village near Hampton Court Palace, one of Britain's most popular attractions and one of Henry VIII's favorite homes. 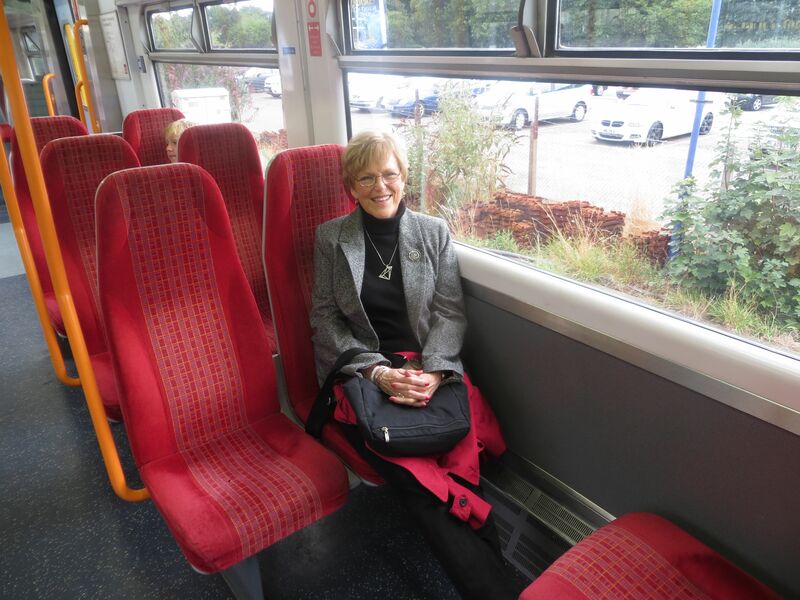 A 25-minute ride on a little red train connects us easily with the city, so we have the benefit of living quietly in a gentle town, but we are still close enough to London to take advantage of its many attractions. All of our forays into the city involve a stop at Waterloo and, from there, an underground to another destination, so we have ample time to observe our fellow travelers. Waterloo throbs day and night with interesting characters: cyclists in sober business suits and helmets making their daily commute to nearby bedroom communities; stalwart girls with rolled-up bedding and serious boots who look as if they're prepared for months of outback living; and on Sunday nights, the still-single working kids who have been home to mummy for the weekend and are dragging their carry-ons back to their town flats. There are families with packs of children straggling along, lone young mothers trying to manage cranky toddlers and enormous prams -- an impossible three-armed job for one person; house painters smudged from their daily labors; upper-crust kids in their crested blazers cracking jokes with each other; dressed-up suburban women going into London for shopping and lunch. I've seen people wrestling with lumber they're taking home for DYI projects, and people hauling everything from portable air conditioners to ladders. Somehow, passengers adjust themselves to make way for the bulky stuff, and sometimes actually assist the poor bloke who's dragging it. There are always dogs, too, which behave nicely as a rule. Better than the children, sometimes. The tourists stand out in Waterloo, not only because of their zip-off shorts and spanking new backpacks (which, by the way, I believe should be banned from the planet because they are a danger to everyone around them), but also because they stop in the middle of the rushing crowd, frowning and arguing over the impossibly -complicated train schedule they're trying to understand. That night, as I dragged my eyes away from the striped skirt trundling up an escalator, I glanced down at the feet of the woman who had sat down beside me. She wore gorgeous silk pumps embellished with discreet gold-embroidered crests on her long, slender feet. As I covertly looked her over, I noticed her expensive black wool skirt, her stylish tweed blazer and her authentic silk Hermes scarf casually tying her look together. Dressed in my over-worn traveling blazer and black jeans, I felt like a bag lady sitting next to such a distinguished-looking person. For a moment, I wondered why she would be wearing gloves on such a mild evening. A second later I noticed her Adam's apple. We nodded and smiled when she saw me admiring her ensemble. Such are the wondrous daily surprises that travel brings! We continued to enjoy the colorful show -- family dramas, lovers quietly whispering as they parted for separate trains, drinking up close and personal people on the move. As we watched the parade, it occurred to me that in every country we visit, we discover more about the locals on the buses, trains and subways than we could learn in any other way. People on a bus or train have no artifice, no agenda. They are simply themselves, getting from one place to another. Their courtesy to fellow passengers, or lack thereof, their adherence to or flaunting of the rules, the way they organize themselves into a loosely structured queues or push ahead of others, those who mutter "pardon me" when they bump into someone else, or don't even acknowledge their gaffe, when added together speak volumes about a culture. And then the BIG "aha" occurred to me! As we walked toward the train to begin our journey "home," I realized that we are such travel junkies mostly because we love to see how other people live, and as Californians we have been deprived of the opportunity to be in physical proximity with people who are different from us! California is such a dedicated car culture that we are all separated from one another by thousands of pounds of metal. It's impossible to have a conversation or even a meaningful moment of eye contact with the guy traveling next to you when you're each roaring down a freeway at seventy miles an hour in your great big Toyotas! And there certainly isn't an opportunity to mingle with Sikhs in beautiful turbans, Africans with flowing robes or English school boys in knee socks when driving an SUV to Trader Joe's in Templeton, California. I mentioned my revelation to Tim, who expanded on my riff by saying, "You're right! That explains why, when we start out on a trip arriving at the airport is always such a surprise. We step from the privacy of an automobile right into the middle of thousands of people who are right in our faces! Suddenly we're all part of one big organism and we're absorbing the stimulation of all those people and trying to catch the rhythm of what's going on around us. That's what makes traveling so exciting!" By then we were aboard the little train, comfortable in the spot we always choose at the back of the car from which we can easily see everything that's happening. On that particular night there were a group of darling young girls, dressed to the nines, looking so fresh-faced and sparkling that I had an irresistible pang of longing to see our granddaughters that very instant! We surmised that they had attended a party in the city. A group of young men had obviously been watching an athletic contest accompanied with ample servings of British beer. They were noisily reliving the event as an older gentleman looked on and seemed to be enjoying their high jinks. The lady sitting next to him obviously was not amused. By the time we reached the Hampton Court Station the footballers and the girls-night-out groups had connected and I'm fairly certain that they were going to continue their evening at one of the pubs that invite travelers to stop for a bit in the village before going home for the evening. Once again, we had dipped into hundreds of other peoples' lives within the space of an hour and when we got into the car for our short drive home from the station, it almost felt as if we'd left a large party! Although I'll never meet the girl in the unflattering black and white skirt, the dignified woman with the pheasant accent, or the person in the Hermes scarf, they all occupy a small part of my mental real estate forever. This small epiphany is just one reason that I know we will continue to wander the world until the wheels fall off!